I'm an animal lover, especially of cats. I was reading about cat first aid, when I accidentally came across a photo that really disturbed me. I had to share it because I think it's just WRONG for anyone to support this type of abuse to an animal. 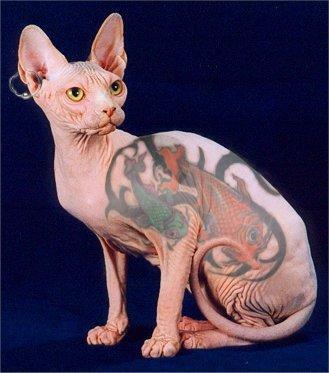 I'm not sure if this photo has been Photoshopped, but I know that many people do tattoo their feline in different parts of the world. Your pet is not an accessory, nor is it supposed to be a work of art, it's a living creature with feelings. This photo made me want to hug my furbaby and never let go. Ewww! You're right, that's just wrong. Following you from Wednesday's hops. How AWFUL!!!! I had never heard of that. What a horrible thing to do! Hi Kimberly, I am a fellow Canadian trying to lose 80 pounds who also suffers from depression. Very glad I found you!!! AGREED. I don't like when people even joke about this stuff. It isn't good ot make light of animal abuse. I'm a new follower from the SimplyStacy blog hop. I'd love if you checked out my blog! Umm...that's a real tattoo? Not just Sharpies? Horrible. People are just horrible. And to pierce the cat's ear? !